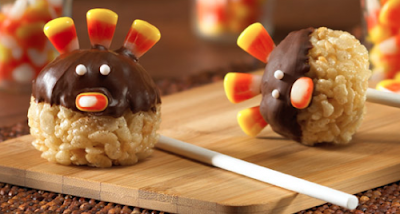 Thanksgiving is just about here, and of course we wanted to share a fun, easy and cute treat that your kids can help you with! These Turkey Pops are quick and easy, and make a sweet treat after supper, for those who don't want to overdo the pumpkin thing. Or a great treat to send to school. This recipe makes 24 pops, feel free to halve the recipe if you don't need that many. 3. Using 1/4-cup measuring cup coated with cooking spray divide warm cereal mixture into 24 portions. Using buttered hands shape each portion into ball. Insert lollipop stick into each. Place on wax-paper-lined baking sheet. Refrigerate about 10 minutes or until firm. 4. In microwave-safe bowl combine chocolate morsels and oil. Microwave on high for 1 to 1 1/2 minutes or until smooth, stirring every 30 seconds. Dip each ball into chocolate, allowing excess to drip off. Return to wax-paper-lined baking sheet. Refrigerate for 5 to 10 minutes more or until chocolate is almost set, but still soft enough to attach candy corn. Decorate with candy corn for tail feathers and beak, gently pressing candy into chocolate and cereal mixture. Press in white candies for eyes, or melt the candy melts and spritz for eyes. Let stand until firm.